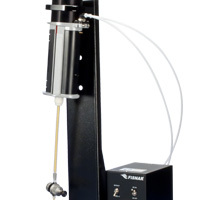 Fisnar fluid dispensers are available with manual or automatic control with a variety of features for adhesive, cyanoacrylate, UV resin, silicone, RTV, and anaerobic dispensing. Dispensers provide precise control during application, contributing to a variety of cost and time-saving benefits. 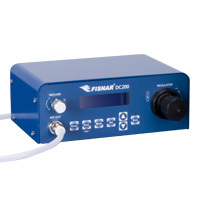 Fisnar industrial fluid dispensing controllers provide precise control when applying adhesive, glue, silicone, RTV, cyanoacrylate, grease, anaerobic, and UV cure resins. Liquid dispensers are available in analog and digital models. Dual cartridge dispensers are an excellent, cost-effective solution for low volume mixing and dispensing of two-part materials supplied in dual cartridges. This bench-mounted system is fully portable and simple to install. 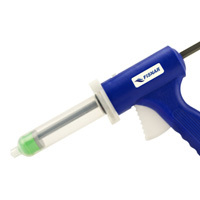 Many liquid dispensing operations can be accomplished using a hand-held fluid dispenser, such as a caulking guns, manual syringe dispensers, flux and cleaning pens, adhesive and silicone cartridge guns, grease guns, or glue tube dispensers. Explore product catalogs and manuals, featured videos, and expert services to learn more about Fisnar fluid dispensing products. Contact us to discuss your specific application.